TPC Overall Rank: #410 out of 2933 rides. User Tracker Count: 541 times. A rather boring coaster, I rode it once. The views are nice, and it's a refreshing ride after the goliath rides at CP, but not for the adrenaline-seeking. Back in 2004, I respected this ride. I thought it was a fun ride. Unfortunately, my view of the ride has changed a bit since then. 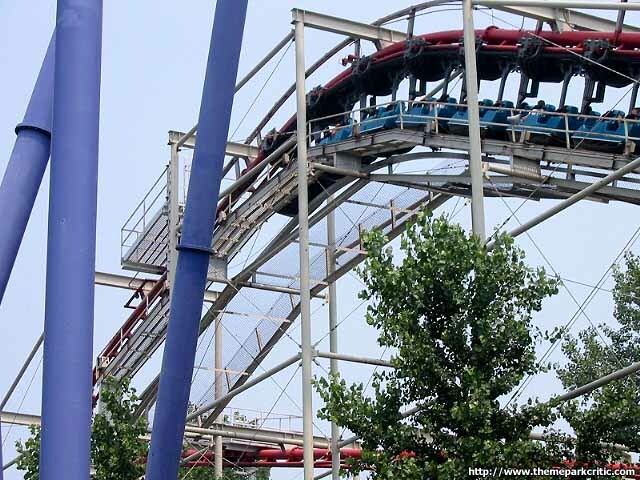 Standing under the newer Mantis, this ride is starting to look a little old and obsolete. The drops and turns aren't as exciting as I thought they were and the overall ride was kind of boring. The pretzel shaped finale over the lagoon is very nice visually, but not much better than the rest of the ride, as far as ride experience goes. Ride it once if you have the time. 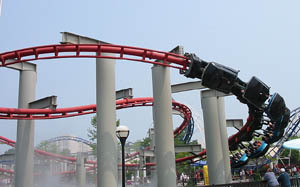 Iron Dragon joins Corkscrew here at Cedar Point as a roller coaster that I just find to be really good and simple fun. At its core, this dragon that emerges from that puzzling blue-green funk of water near the station is merely an above average suspended coaster. But for me, it offers a wonderful change of pace coaster to take a break from the high-intensity thrill machines. Its not really a "relaxing" coaster per se, but it certainly seems like it here. The setting is pretty good, although I must admit that before some trees needed removed for TTD the setting was even better, and might have garnered it another point. As it is, its still surrounded by a decent number of trees, especially in the first half. The crew really hustles on this coaster, and most times they also run 3 trains, so waits on this are very minimal, which is also an enticement to snag a ride several times during visits. The cars are comfy, and after some checks, this dragon departs its lair. The lift hills are very (and oddly) slow on Iron Dragon, but once at the top of the first one, the train goes down a nice drop, even though it is not very steep. Theres a bit of swinging as this creature coils itself through the trees and winds its way, rather peacefully, towards the second lift hill. The speed in this half, after the first drop, sputters out rather quickly, but thankfully this coaster ends with a bigger bang. Peaking the second lift, the coaster executes a quick drop and picks up a good head of steam as it curves around and heads to the highlight - the ending over the lake. This ending for me is what bumps it up to the levels of an above average coaster. 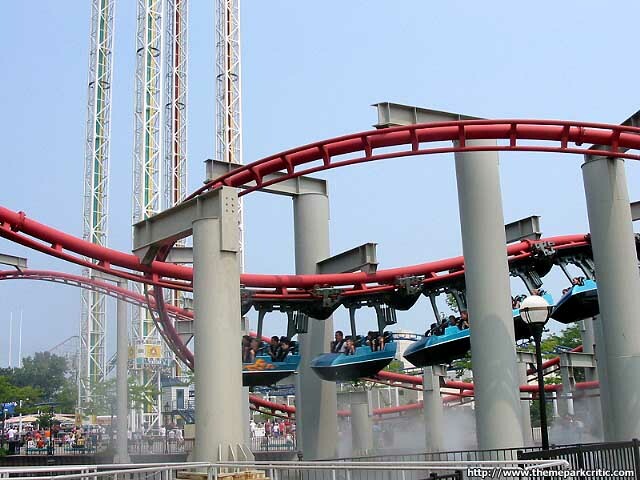 This steel dragon wants to leave an impression, so it sends riders swooping down to the lake via the rides best drop, and what follows is a fairly good helix element that gets the train swinging as it skims the lake and picks up a little mist before charging into the brakes. Throughout the ride, Im having a great time laughing and enjoying the simplistic nature of this fun coaster. The speed really doesnt pick up until the finale, and overall the layout is rather tame, but theres just something about it that I like. This is a great starter adult coaster for younger kids, but also a great coaster for the young at heart! Its not the end-all be-all of coasters, but it is fun, and that to me is worth something. Give this dragon a go, and you may be pleasantly surprised with the ride you get. This ride has grown on me over my last couple visits. When I was younger it just didnt do anything for me. 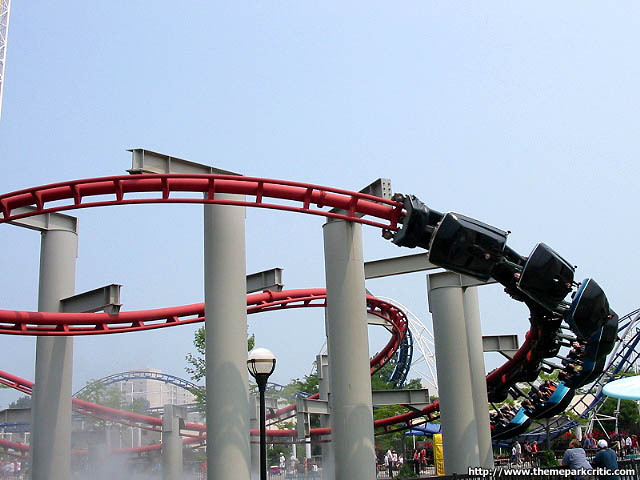 I felt it was too slow when compared to Vortex at Canadas Wonderland or Big Bad Wolf. Now I look forward to riding it, and my last visit in 2006 I may have ridden it more than any other coaster at the park (either this or Blue Streak). Mostly because it had a very short line, but I also found the coaster to be a fun, fairly unique ride. Its a much better ride in the front car of the train versus the back car. There seems to be more swinging action at the bottom of the first hill, in the lagoon helix, and especially the last turn into the brake run. My favorite part of the ride is the twisting hill going down from the second lift hill. As some others mentioned, this was much better before they added TTD because it was in the trees, hidden from view, and was very dark at night. Now this portion of the ride is in site from the TTD area and isnt as dark at night anymore, but is still a very fun section of track. I hope this ride remains for years to come. I dont have anything new to add, suspended coasters are cool but this one is just too slow. I like the location but it looked much better before dragster was built. Now it just looks crammed in between Mantis and Dragster. The new paint job is horrible too. They should get rid of it and save themselves the cost of mantaining it. 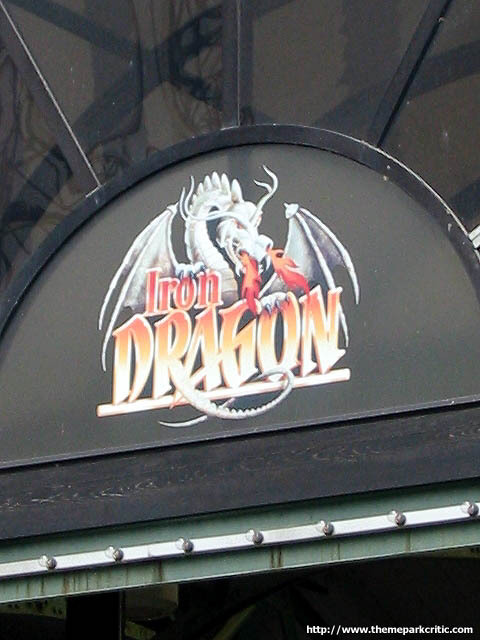 Iron Dragon had its moments, but for the most part was pretty mediocre. The first drop was decent, as it was quick but not very steep. The following turn was great as well as there was some excellent swinging. After that the ride was very boring, slow, and uneventful until the final helix over the lagoon, which was pretty good, as there was decent swinging and decent forces. I thought it would be fun, after seeing the helix-lagoon and the fact that it was my first susended coaster. But this was a really lame ride, most likely one of the most disapointing ones at CP. I tried to ride this one with an open mind, but after my head bobbing around with the train going at speeds of approximately 10 mph, I realized that the 5 minute wait it took to get on was not worth it. Decent suspended coaster. The misty lagoon is the best part. Ill take big bad wolf at busch gardens over this anyday.